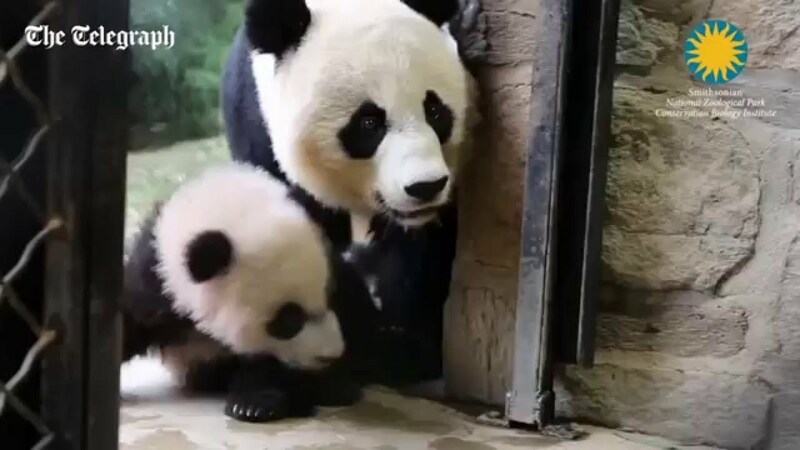 Have a look at how enjoyable this baby panda cub is when playing and experiencing fresh air with his mother in their enclosure because this is the first time he has been permitted to venture outside since his birth. This adorable baby panda cub’s name is Bei Bei, chosen by First Ladies Michelle Obama (USA) and Peng Liyuang (PRC), meaning “precious treasure”. He is a giant panda cub was born on August 22, 2015, at National Zoo in Washington D.C. This panda is a part of China-United States relations panda diplomacy and will have been returned to China at the age of four. Bei Bei is the lucky one that survived, beside a smaller twin died four days after their birth so that he is seem a gift worthing being loved by many visitors.